My parents have been sending out homemade Christmas cards since I can remember, family pictures included. I grew up assuming everyone did this, but looking back now, my parents were definitely just lucky to have a group of friends who also sent cards. Brian and I don’t have many people to send christmas cards to, since we will see our families over the holiday and most of our friends couldn’t care less about getting a card. I wanted to get something small for my two favorite doormen at work and our landlord, so I went to Paper Source and found some adorable postcards from Rifle Paper Co., my fave. 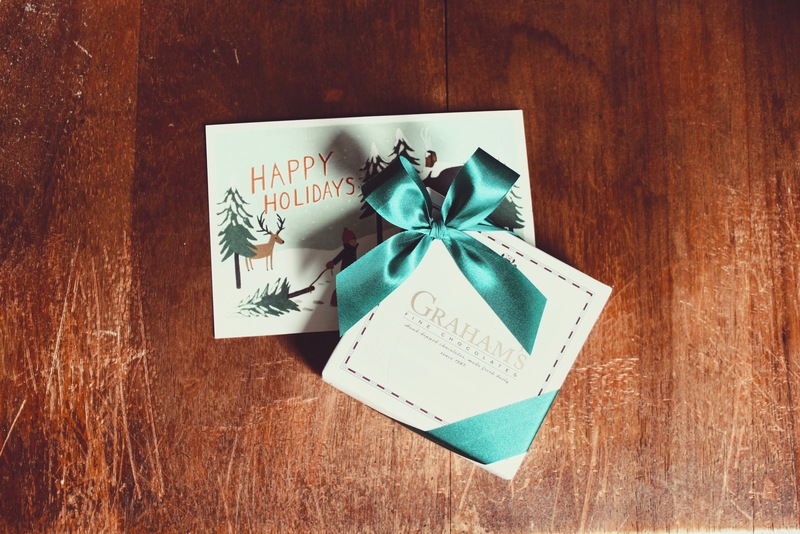 I bought little boxes of chocolates from Grahams (my favorite hometown chocolate shop), and with the postcard I think they’ll be perfect gifts. I love giving gifts, especially when they’re small but I know they’ll be appreciated. This is the perfect compromise between full blown Christmas cards and a small holiday note.